As the baby boomers enter their twilight years, we expect to see a need for more and more home healthcare options. First of all, the ratio of elderly patients to physicians will be changing. Second, things that were once thought to need long term facility care can often be handled at home, with the aid of some professional help. In 2015, more than 20% of elderly citizens listed in poor or fair health were still living at home, rather than in a facility. There are many reasons that people decide to stay in the home - financial situations and personal preferences are both high on the list. Whatever your own situation, the medical community strives to aid in treatment plans that honor your lifestyle, as well as your medical needs. 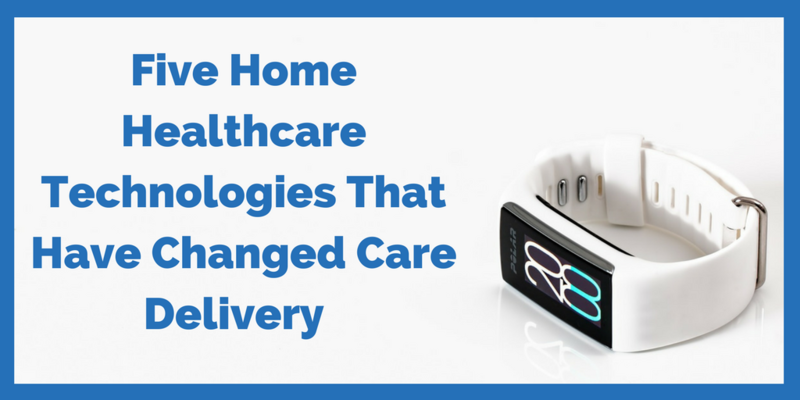 Technology has brought about a lot of fantastic changes for the medical community and this includes numerous advances to aid in home healthcare. In some situations, a permanent placement facility will be the optimal solution. But there are many options along the way so that seniors can maintain independence and quality of care is never sacrificed. If you're currently considering options for the future of yourself or a loved one, some of these advances might be an excellent addition to your home healthcare plan. Telehealth Equipment. This sounds fancy and expensive, but it might be a simple solution to keep your patient under the regular care of a doctor through the internet. Telehealth is a way to monitor the patient's vital signs and other pertinent information so that the physician can access reports remotely. This allows the physician to change treatment plans or recommend that the patient come in ahead of schedule. For instance, some patients might use a machine to help them breath for sleep apnea. The physician would be able to assess how often the patient used the machine and whether it was removed in the middle of the night or whether sleep was disturbed. This could aid them in assessing other areas of treatment, such as monitoring blood pressure. Test Kits. Test kits have been available for a number of years to monitor health watch areas such as blood sugar levels. Use of these kits can help patients monitor their progress and adjust their medication and dietary needs. In cases where there are large spikes with no reason, the patient can confer with a doctor immediately. Often, patients who don't test at home aren't aware of the symptoms they're experiencing. Early detection can be the key to better treat ongoing issues and new developments. Medical Equipment. Today, medical equipment such as hospital beds and chair lifts are available for the home. In cases where there is long term illness, this can offer the best form of care so that patients can stay in the home with a family care taker or a professional healthcare service for support. There are many options in medical equipment for the home, and in some cases data can be sent to the primary physician. For instance, a hospital bed might be equipped with sensors to monitor the patient's vital signs. This allows the physician to look over long term data and determine the current condition of the patient with greater certainty. Home Sensors. This isn't a medical invention but it can be an excellent tool for those caring for elderly relatives at home. Home monitoring systems are available to install cameras and remotely control any number of things from your phone - this includes lights, locks, and the ability to call emergency personnel to the home. Installing a home monitoring system can give family members an extra measure of security so that they can check on their elderly relative when they can't physically be on the premises. It also allows the patient to maintain their own independence for a longer period of time. Assistive Technology. Assistive technology might include items like scooters or other devices to help with mobility around the house or neighborhood. Homes may need to be fitted for some solutions, such as chair lifts or ramps where there are staircases. Today's technology has made it easier for patients to maintain their independence for longer. If you're currently considering options to keep a loved one at home, it's important to recognize that there are many solutions. You may decide on a primary caregiver or work with a professional service. Often there are medical and technological devices which can help manage care for better outcomes and a higher quality of life. If you’d like advice on next steps for you or a loved one, we can set up a conversation to discuss you and your family’s care needs, and see if in-home care is right for you! Copyright © 2018 Bluebird Homecare Inc.